Classic hoop earrings with a contemporary twist. 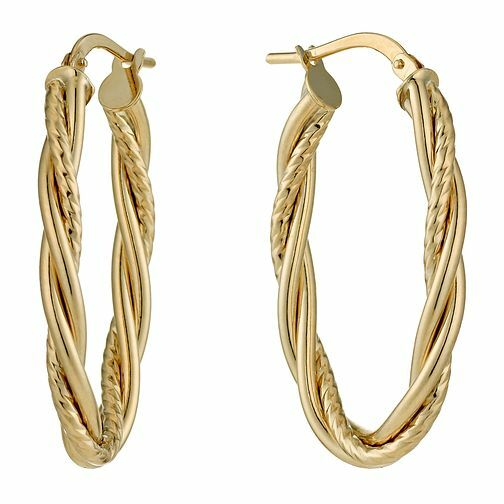 Featuring 9ct yellow gold with contrasted smooth and twisted metal entwined to create a distinctive oval creole earring perfect for everyday wear. 9ct Yellow Gold Oval Fancy Twist Creole Hoop Earrings is rated 5.0 out of 5 by 5. Rated 5 out of 5 by Anonymous from product has excellent design Excellent quality very pleased with the design of these earrings. Rated 5 out of 5 by Anonymous from excellent value Excellent value. Just what my daughter wanted; she was really pleased.